Getting ready for Halloween is a lot of work. Sometimes, it can even look like a construction zone. 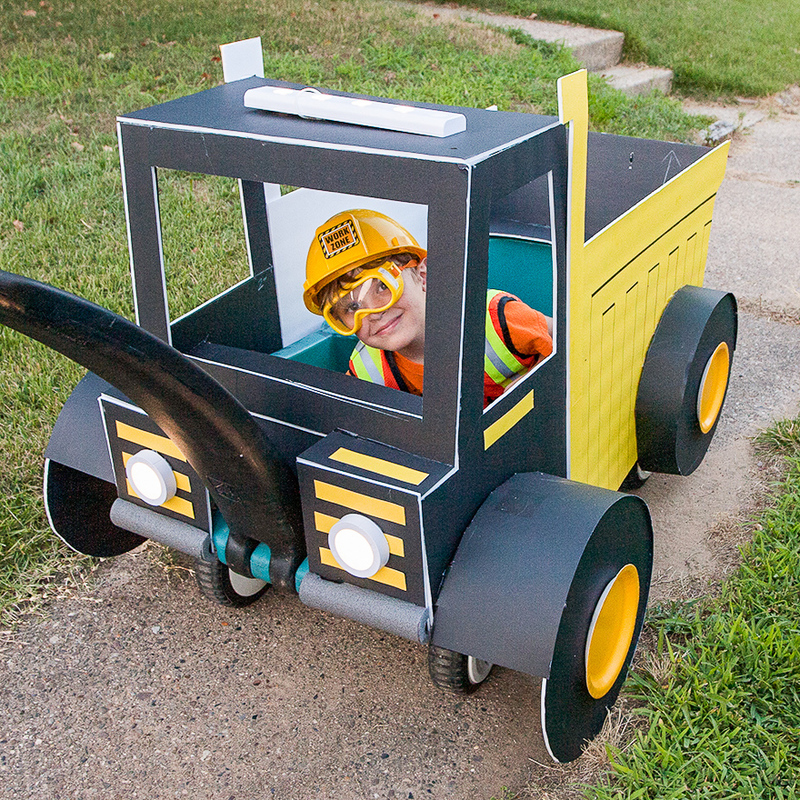 Which happens even more so if your little one wants to be a construction worker for Halloween. A lot of hard work goes into crafting the perfect look each year. When you’ve got all the clothes and tools to make your construction worker look authentic, there’s another step you can take. 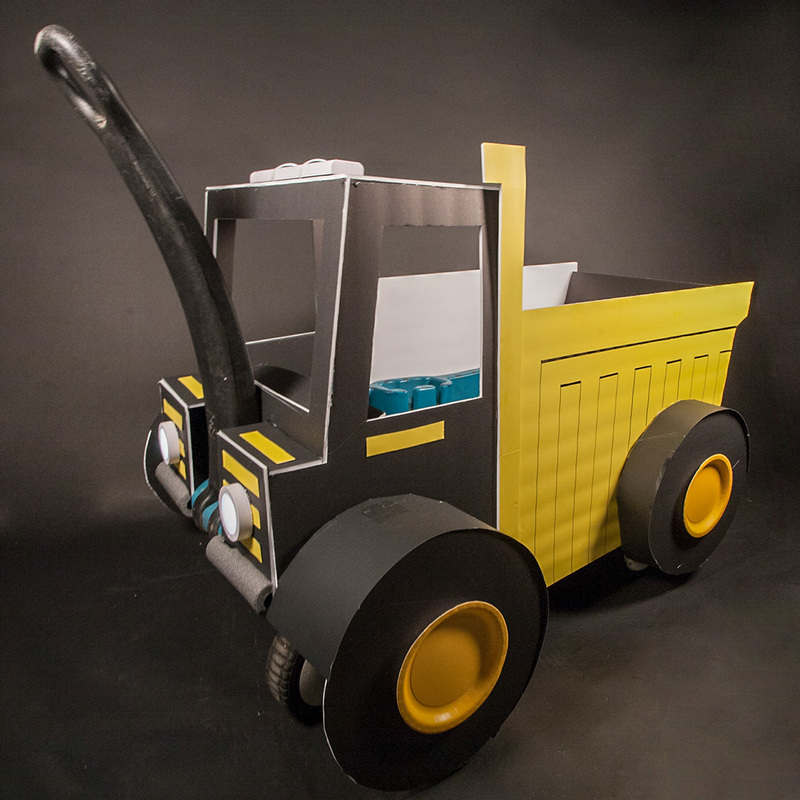 This DIY Dump Truck Wagon upgrade will help take your little one’s construction worker costume to the next level. This project was designed to fit my “step 2” wagon. You can modify the measurements of the pieces to fit whatever wagon you might be using. I got my foamboards from the dollar store, it’s more economical when using a large quantity. I found plenty of LED type of lights at Walmart for under $10. Steps 1-14 are for creating the side panel of the dump truck. As you are making the pieces, you can cut 2 of every piece, so you can then create both sides of the dump truck. Make sure the pieces for the second side are assembled in the opposite direction. Step 1. 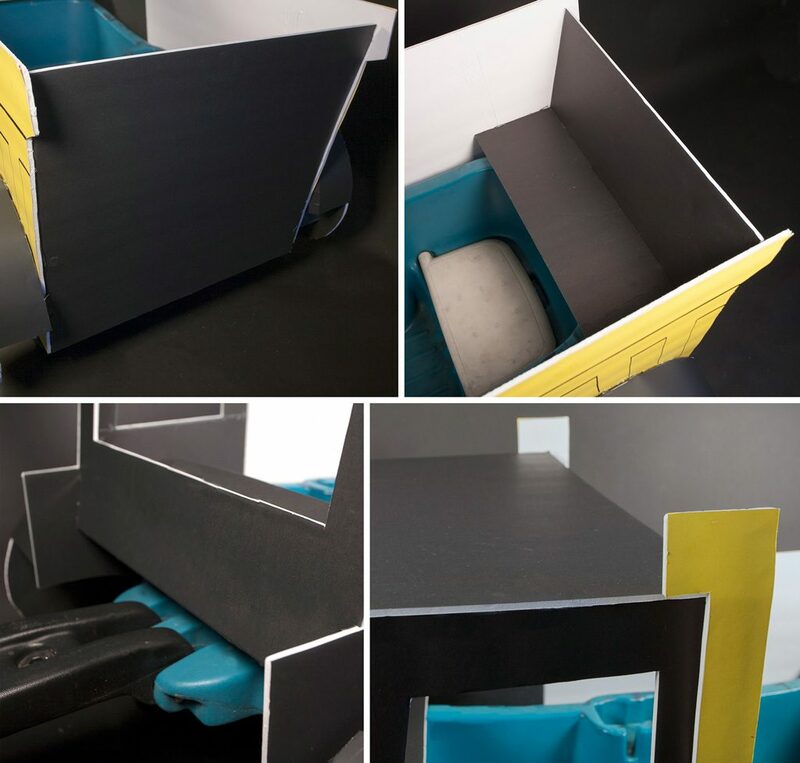 Cut a piece of black foamboard to make the cab, using the measurements as shown in the diagram for step 1. Step 3. 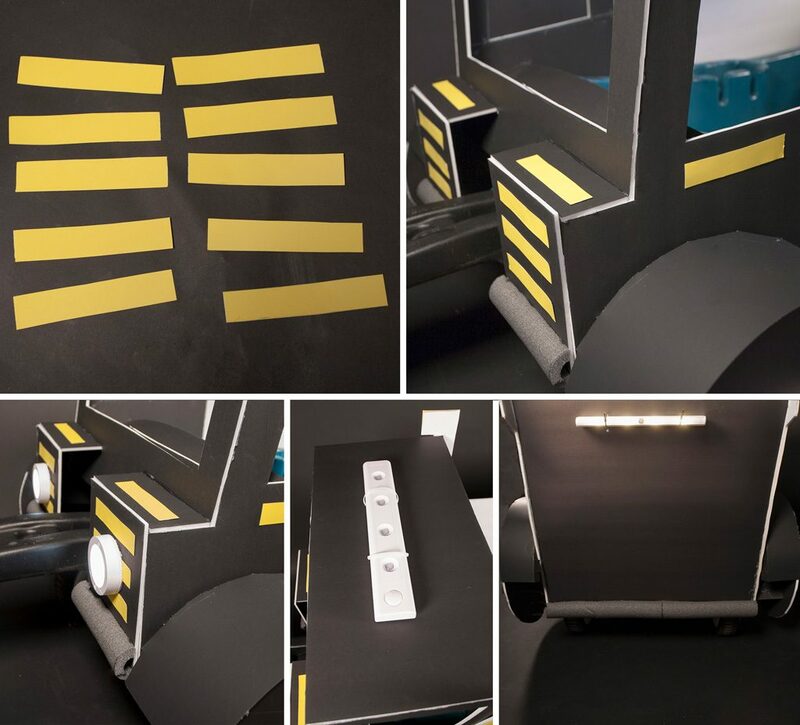 Use the spray glue to adhere another sheet of yellow posterboard to a piece of white foam board. Cut the piece of foam board, using the measurements as shown in the diagram for step 3. Step 4. Line up the truck bed with the cab, leaving about an inch between the bottom of the truck bed and the bottom of the cab. Overlap the truck bed and the cab with the cut piece from step 3. Use the hot glue to secure the pieces together. Step 5. Use the black marker and ruler to draw straight lines on the truck bed, as shown in the picture. Step 6. Hold the completed panel up against the wagon with the cab toward the front of the wagon. Notch out a curved piece at the front of the cab to allow room for the wheels of the wagon to turn freely. Step 7. Cut two 12” circles from the black foamboard to create the wheels. 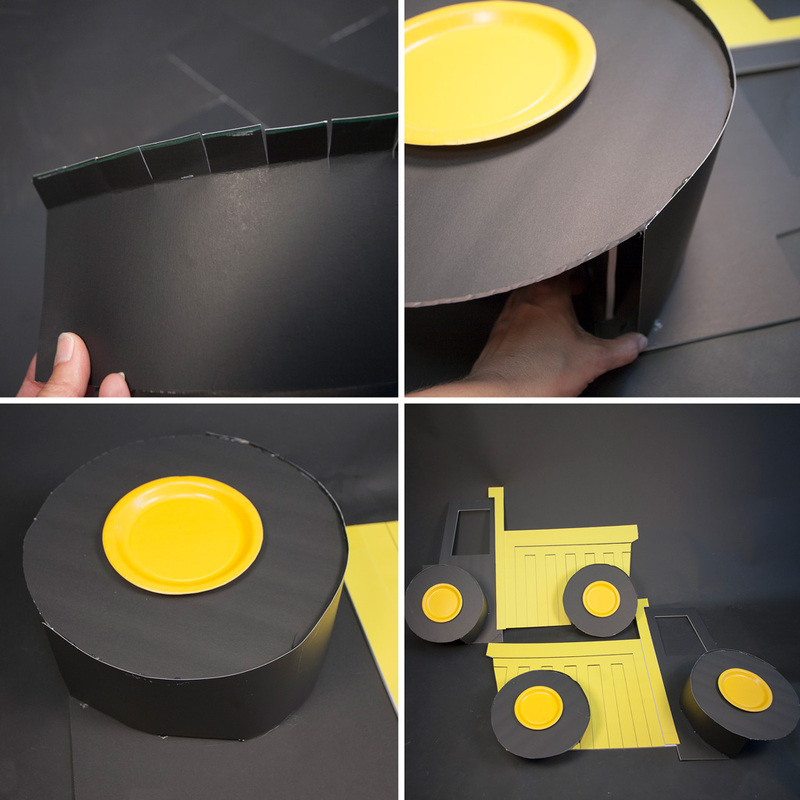 Glue a yellow party plate in the middle of each wheel. Step 8. Cut three- 3”x3” squares from a sheet of black foam board. Hot glue the squares, in an arch shape near the back base of the truck bed. Step 9. Hot glue one of the wheels to the squares, so that the wheel hangs about 1” lower than the truck bed. Step 10. Cut three- 3”x6” rectangles from a sheet of black foam board. Hot glue the 3” edge of each rectangle along the notched out section of the cab. Step 11. Hot glue the other wheel to the rectangles, so that it sits even with the back wheel when you set the side panel up against the wagon. Step 12. Cut out a strip of black poster board 7” wide x 28” long. Fold the long edge over 1” and crease. Cut 1” tabs along the folded edge. Step 13. For the front wheel, hot glue the long, straight edge of the poster board along the edge of the wheel. Start where the wheel overlaps the body of the cab. The folded edge will tuck inward, and get glued to the cab. The poster board will only cover the tops of the wheels, NOT all the way around the bottom of the wheel. Step 14. For the back wheel, you will need to cut a strip of black poster board 4” wide x 28” long. Repeat the same process from step 12-13. Step 15. 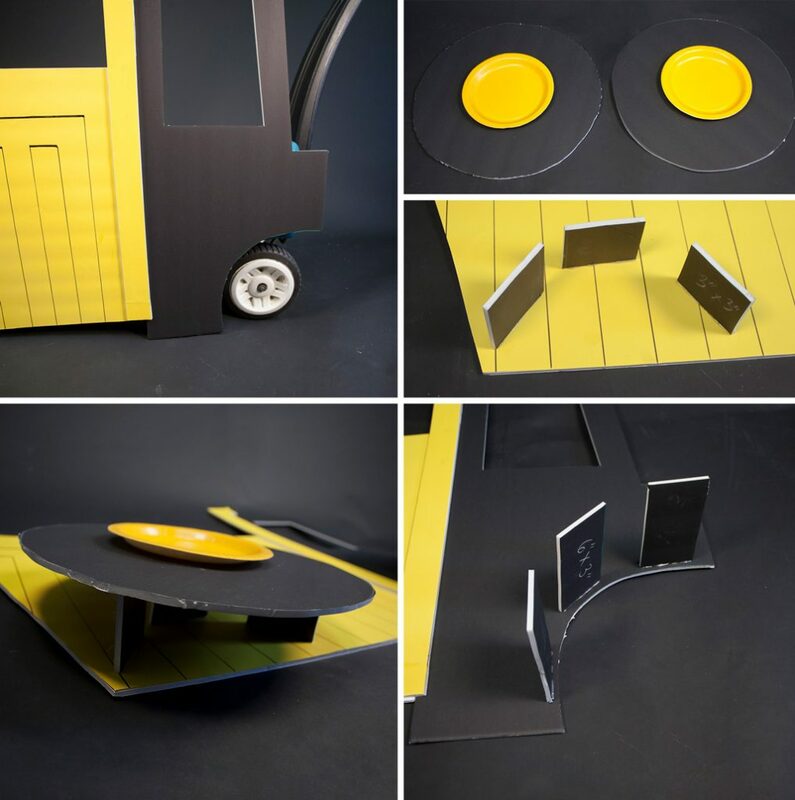 Repeat steps 1-13 to complete the opposite side of the wagon, make sure the parts for the cab and truck bed are assembled in the opposite direction. At this point, you will need the wagon for the assembly. Step 16. 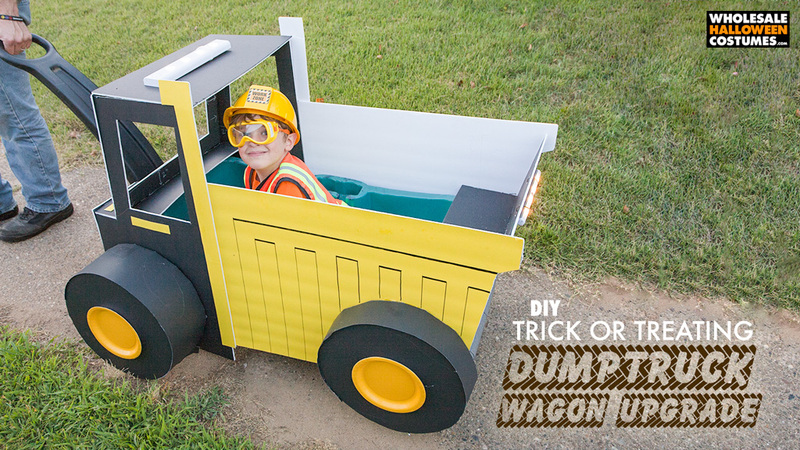 Cut a 20” x 20” piece of black foamboard to use as the back of the dump truck. Hot glue the sides of the dump truck to the back piece. Step 17. Cut out a piece of black foam board 6” x 20”. 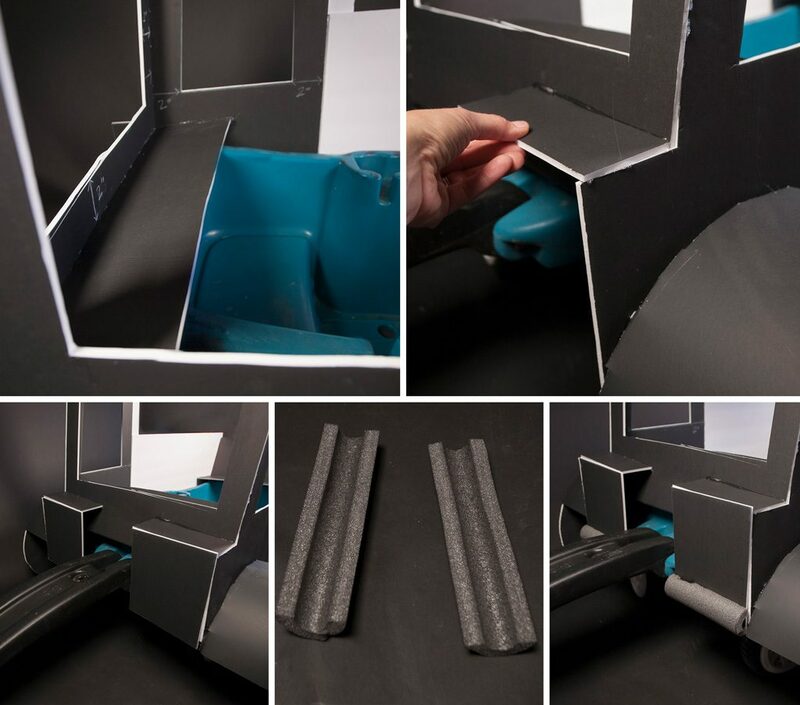 Lift the back of the dump truck so the wheels are slightly off the ground, and hot glue the foam core piece to both sides and the back of the dump truck, so that the back of the dump truck will be supported by the wagon. Step 18. Cut out 2 pieces of black foamboard using the measurements as shown in the diagram for step 18. Attach the windshield to the front of the truck. Line the top of the windshield with the top of the truck. The bottom half of the windshield will sit just above the handle of the wagon, as shown. Step 19. Cut out a piece of black foam board 6” x 20”. Lift the front of the dump truck so that it sits level with the back, and the wheels are slightly off the ground. Hot glue the foam core piece to both sides and the front of the dump truck, so that the whole dump truck will be supported by the wagon. Step 20. Hot glue the other piece of foamboard from step 18, to the top of the cab. Step 21. Cut two- 7” x 4” pieces of black foam board. Attach the pieces horizontally to the front of the cab, on either side of the handle. Step 22. Cut two- 7” x 8” pieces of black foam board. Attach the pieces to vertically to the front of the cab, to finish the front shape of the cab. Step 23. Cut a 7” piece of the pipe insulation. Slice the tube in half longways to create two- 7” pieces. Step 24. Carefully glue the pieces to either side of the front of the cab to create the bumper. The hot glue can melt the foam tubing, so it’s best to add only a little bit at a time until it sticks to the foam board. Step 25. 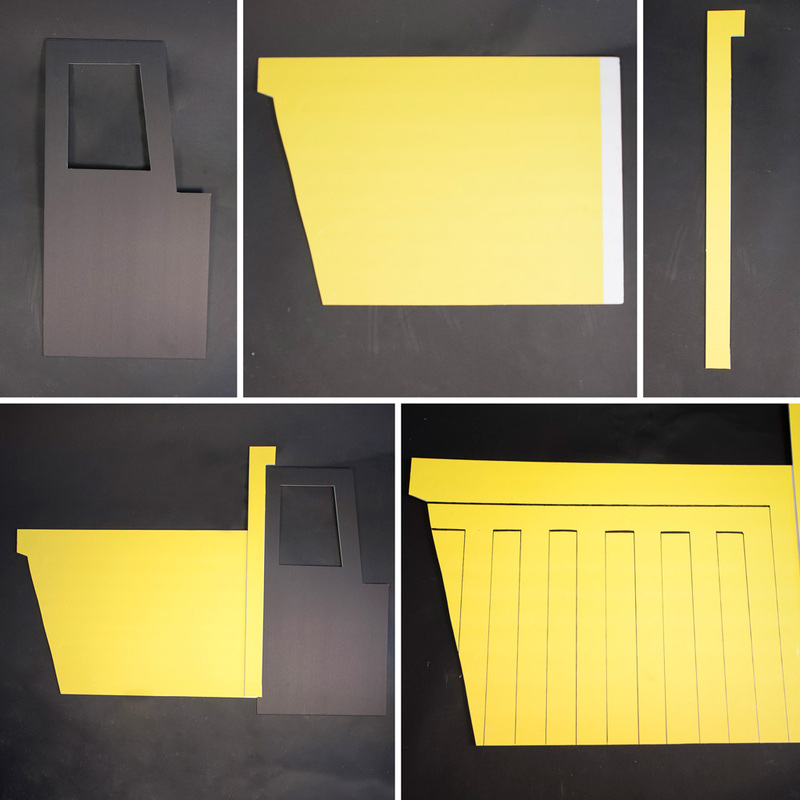 Cut ten- 1” x 5” strips of yellow cardstock. Step 26. Glue the strips to the cab. Three strips on each side of the front grill, one on each side of the hood, and the last two on each door as a handle. Step 27. Attach the LED puck lights to the front of the wagon. I used hot glue, some of the lights come with their own adhesive. Step 28. Attach an LED light strip to the top of the dump truck, using the cable ties. Step 29. Cut a 20” inch piece of pipe insulation, slicing it in half longways. Attach one half to the back of the dump truck as a bumper. Attach an LED light strip to the back of the dump truck, using the cable ties. Step 30. 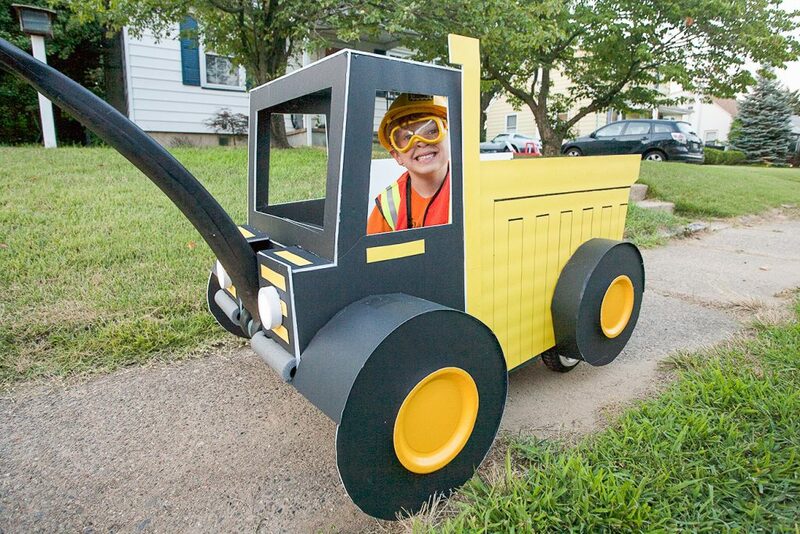 The dump truck is done and all lit up for a safe night trick-or-treating! 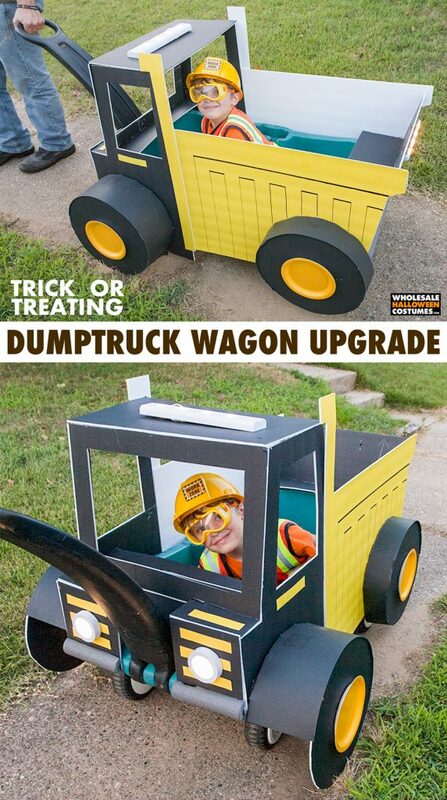 Load up the wagon and get ready to do some serious work this Halloween. 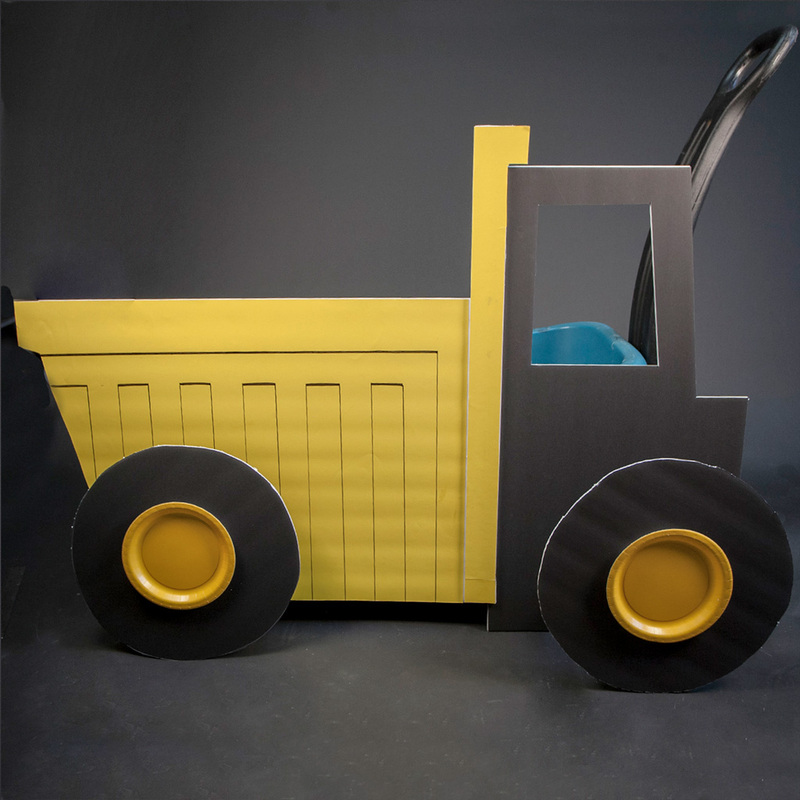 Your little construction worker will love both riding in the dump truck wagon and using it to cart around the spoils of the night. 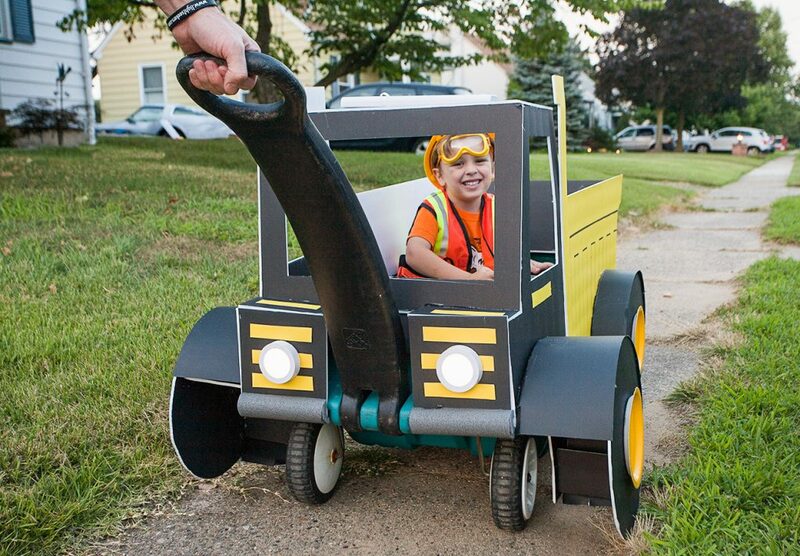 If you’re heading out with your own version of this dump truck wagon, we’d love to see! Tag us in your pictures on Facebook, Twitter, or Instagram! See what we’ve been saving on Pinterest too!